Our mission at Love INC of DeKalb/Sycamore is to mobilize the church to transform lives and the Greater DeKalb area In the Name of Christ. Love In the Name of Christ operates as a central clearinghouse and ministry center, receiving calls for needs of all kinds and verifying the legitimacy of all needs. Love INC empowers Christian volunteers to meet needs and accomplish ministry through our GAP Ministries with our partner churches. We also make sure that, as a ministry, we have all the resources and help of area agencies and organizations at our fingertips, including complete knowledge of the ministries and services of each network church. 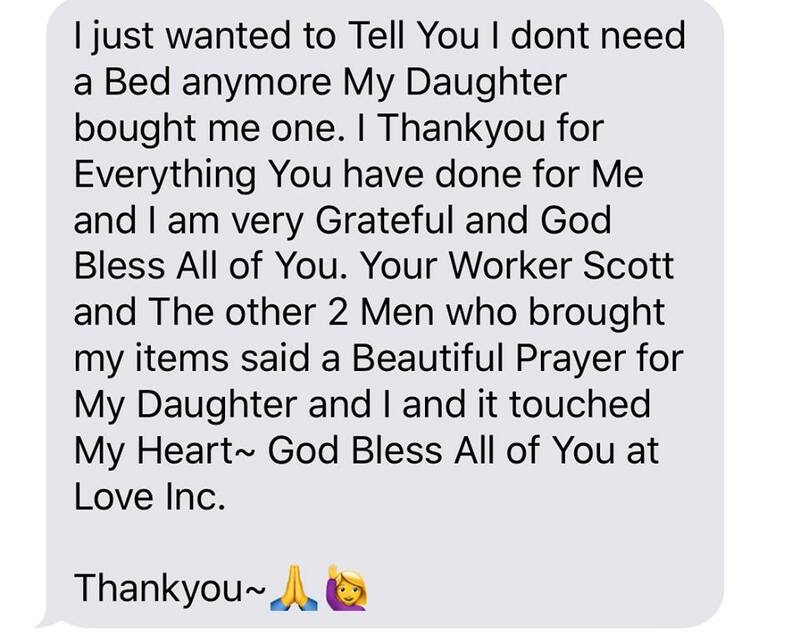 Love INC strives to be the best steward possible of the variety of resources that will help people with legitimate needs. For individuals and families with chronic needs we hope to expose them to ministries and agencies to help accomplish long-term change. We desire to see transformation come to homes and our communities because of our coordination and network approach to ministry. All clients go through an intake and verification of need process before assistance is provided.